The videos available here have been well annotated by many students in the last couple of years; they particularly value the concise refresher to concepts that may have been mentioned in workshops, either by myself or by colleagues. I reckon that mindmapping is particularly valuable for those with visual preferences as a learning style; not everyone finds it useful. Explore the free resources and demonstrations available on this website. Disruptive innovation will feature as one of the ideas could be explored during the second day of the workshop. You may also find the interview at Thinkers50 interesting. 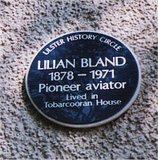 My attempt to tell the story of this entrepreneurial engineer who designed, built and flew her own aeroplane in the north of Ireland in 1909-1910. My attempt to tell the story of this entrepreneurial engineer who designed and constructed many of the railways in Ireland in the 19th century. Take a few minutes to explore other clips from this BBC television series, looking in particular for examples of effective elevator pitches in which the champions introduce their ideas. An introduction to mind mapping from MindTools. Spend 3 minutes watching the video and then study the related resources, seeking to identify any personal benefits you might be able to gain from using this technique. Visit their website to explore the other resources that are available to help as you develop your understanding of relevant concepts and models in this part of your academic programme. Customer journey mapping has been gaining in popularity as a management technique in recent years. Use your online search skills with the phrase customer journey mapping to find out more about this technique and its potential for adding value to the work done by your organisation.